Scientists do not have a clear understanding of the exact process by which food texture is sensed. But now, a new study by UC Santa Barbara biologist Craig Montell and his research team sheds light on how fruit flies "feel" foods based on two important textural features—viscosity and hardness. Their findings appear in the journal Neuron. "The food industry knows very well how important texture is to the appeal of foods," said Montell, the Robert and Patricia Duggan Chair in Mathematical, Life, and Physical Sciences in UCSB's Department of Molecular, Cellular, and Developmental Biology. "But despite the intense effort by many groups, including our own, in looking at how chemicals in foods affect the appeal, little has been done to understand how food texture is sensed." Lead author Yali Zhang, a postdoctoral fellow in Montell's lab, was fascinated by how flies sense food. "That is why I decided to embark on this project, since very little is known about the identities of the cells and receptors in the fly 'tongue' that are responsible for detecting food mechanics." 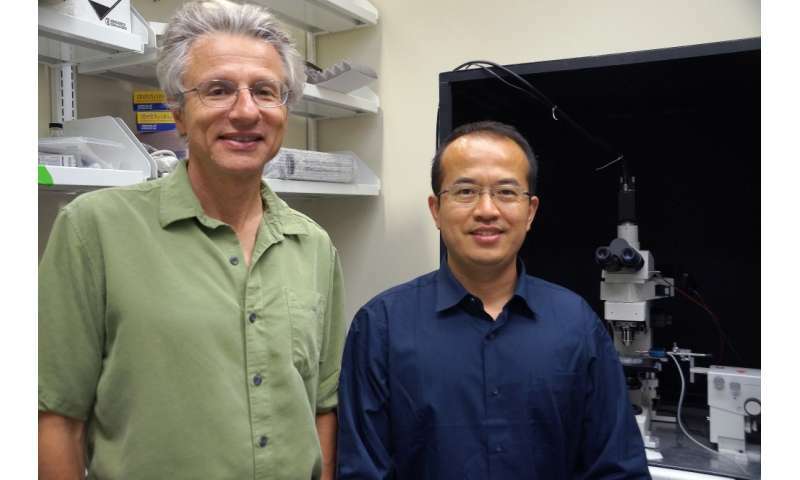 Montell, Zhang and collaborators Tim Aikin and Zhengzheng Li discovered a single cell responsible for the insects' ability to distinguish food texture. Located in the fly's main taste organ, this neuron sends out many long, thin extensions, called dendrites, into the bases of taste hairs distributed on the surface of the tongue. "When confocal microscopy showed me this beautiful multidendritic neuron in the fly tongue, I was thrilled because it had not been reported before," Zhang said. "I thought it must do something unique and important." Zhang was right. When the bristles on the end of the fly tongue come in contact with food, they bend, and do so in proportion to the hardness of the food. As a result, this activates the food texture neuron to varying extents. Because the bristles are on the outside of the fly tongue, the insect can evaluate food texture before ingesting the food. "Force activation of this food texture neuron tells the fly whether to eat or not to eat, depending on how hard or viscous the food is," Montell explained. "The fact that one neuron can control opposing behavioral responses is very different from sensation of the chemical properties of foods, where one set of neurons is stimulated by attractive foods, such as sugars, and a different set of neurons activated by bitter foods causes a stop-feeding signal." The investigators also identified a cell surface protein called TMC—transmembrane channel-like—that is critically important in the food texture neuron. The TMC protein in flies is related to a human TMC essential for hearing. While hearing and food-texture sensation may seem unrelated, both are types of mechanosensation. Sound moves the eardrum, which activates cells inside the ear, while the movement of taste bristles by the physical properties of food activates a neuron in the fly tongue. This suggests that TMC may be an important part of a mechanosensor that functions both in humans and in flies, for hearing and taste, respectively. "No one has actually shown that human or fly TMCs are sufficient to function as mechanosensors, due to challenges in expressing these proteins in artificial systems that would allow investigators to address this question," Montell explained. "While TMCs are candidate mechanosensors, they may not be acting alone. "Identifying other proteins that play roles in food texture sensation in fruit flies is an important next step," he continued. "Because there are eight different types of TMCs in mice and humans, it would be fascinating to learn whether any of them has a role in food texture sensation in mammals."